She Settled For ‘Just Enough.’ Now She’s Tripled Her Revenue And Runs Her Business From Overseas. Erin Howard plans out her day out of her home office in Cambridge, U.K. She checks with her full-time manager Ashley back in the United States on an upcoming yoga-and-wine event at a condo association … then Erin takes a pre-qualification call from a bride-to-be and sets up a sales consultation. 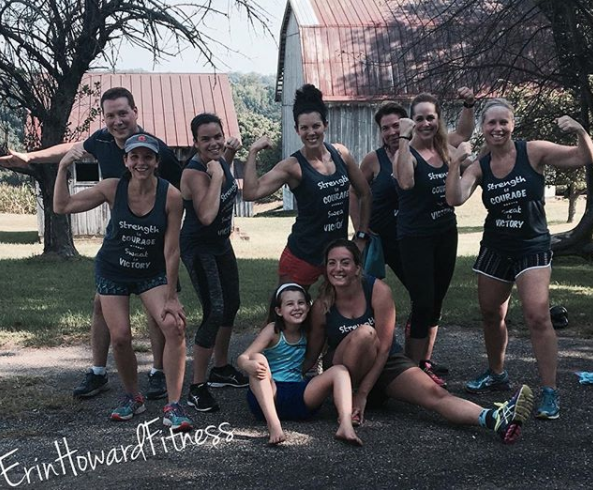 In fact, only nine months earlier, Erin was in her 12th year of supporting her family (graduate-student husband and three daughters), eking out about $3k a month in her in-home personal training business in Baldwin, MD-based Erin Howard Fitness. To see if she could do better, Erin signed up for NPE in March 2017. After some intense NPE online training, Erin experienced what she describes as a fundamental mindset change, and things could never be the same again. As if to test her commitment, life threw a twist of fate. Erin had to reset all her goals. Here’s how Erin tripled her revenues within six months, and set up her business so she continue growing her business while overseas. Building your business starts with hard work, but that doesn’t mean you can’t smile and enjoy the ride. Happy just getting by. Really. 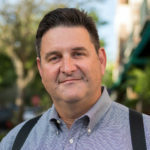 Erin Howard’s husband was a graduate student in ancient languages and civilizations of the Middle East, a long and arduous course of study requiring high levels of commitment. As he worked his way through his studies (12 years worth), Erin supported their family as an independent personal trainer, working part time in others’ fitness studios, but also training clients on her own. She loved the work and she loved changing her clients’ lives. But she didn’t always earn that much money, and she felt a lot of stress financially. 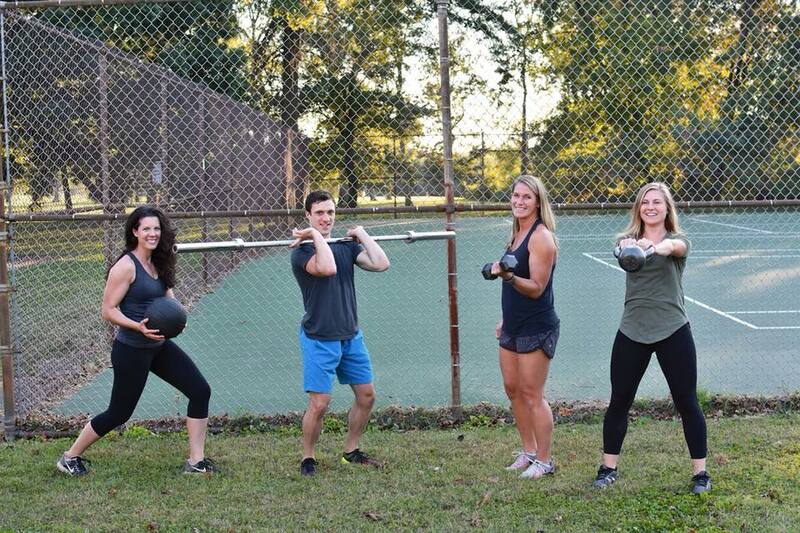 She went out on her own with Erin Howard Fitness in 2015, and a $200 check from a client accounted for her first month’s revenues. She grew her business and made up her mind that as long as she could support her family and do what she loved for a living, she was OK. Besides, even if she wanted more, what were the next steps? Her time was maxed out. She built her business to about $3k a month by February 2017. 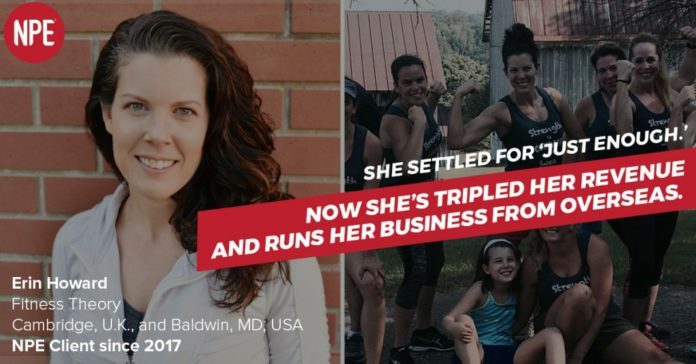 By then, she been receiving emails from NPE that indicated someone understood the challenges she faced as a fitness business owner and that she didn’t have to face those challenges alone. Then there was the insistence that she could double her revenue. She was encouraged to dream bigger. She thought she’d be really ambitious and set a goal of $8k a month within 12 months at NPE. She signed up, not really believing, and began her online lessons. Erin and the people close to her show off their readiness to take on tough challenges. Erin credits the biggest change as mindset. In fact, she credits one specific lesson blowing a hole in her thinking–a “before and after” moment for her, where nothing could go back to the way it was. Lesson 5: Taking an empowering stance of the “Getting Started” series. She said the changes that went into her thinking was practically like surgery. Instead of moving forward in a state of fear of what other people might think, she took an empowering stance and decided not to care what other people thought about her, because she was doing the right thing. Excited, with a new mindset, and motivated, life threw her an unexpected curve. Two months into NPE, her husband was offered a research position at Cambridge University, U.K. But things couldn’t go back. That meant coming up with a new idea for her business, because she needed to create a business bigger than herself, and in seven months, rebrand, train, hire, and market a new business. Fitness Theory was born. 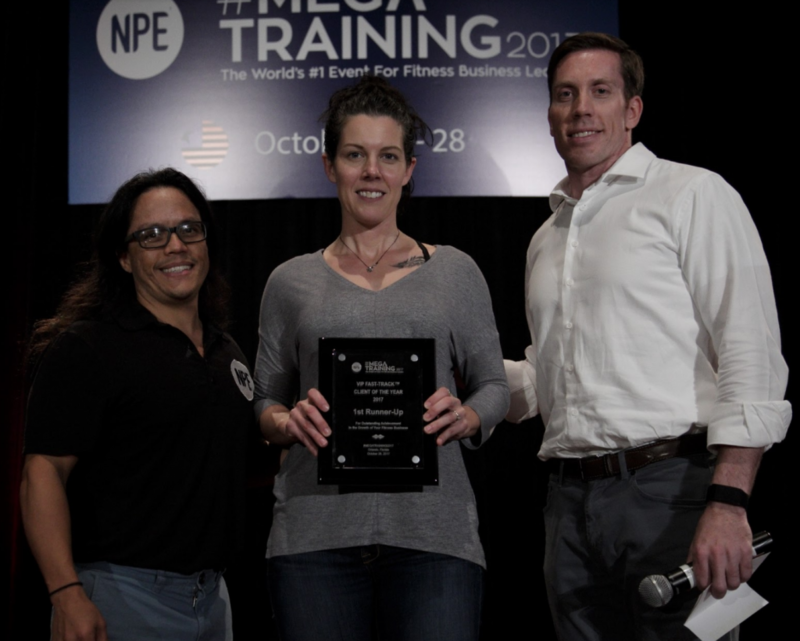 Erin’s success story led to her being named 2017 NPE Client of the Year Runner Up for the NPE FAST-TRACK™ program. In February 2017, after two years of stagnation running her own business, Erin’s monthly revenues were $3k a month. In March 2017 Erin joined NPE and with new sales and marketing systems, tools, and resources. She hit $4k by the end of the month. In May, she learned of the Big Move to the U.K. She still hit $7k. In June, she hit $9k, exceeding a goal she had expected to barely hit sometime in 2018, before she developed her new mindset. Through the rest of 2017, Erin focused on preparing her new business to be run from overseas. Fortunately, her NPE coach in the U.K., Greg Small, has experience running fitness businesses in Australia from the U.K., so he was well-placed to advise her. Erin hired/trained a manager to run the business in the U.S. Erin directs the business, conducts sales calls, and continues to build her business and live her dreams. “This is not just a successful business, but an investment in my future and my family’s future, and I could not have done that by myself. Erin is a member of the NPE FAST-TRACK™ program, where we help clients grow from $3k-$10k a month in revenue. To learn more about the NPE FAST-TRACK™ program and other fitness business coaching programs we offer to start, grow, and scale your business click the link below.